E-Safety - A brilliant document. 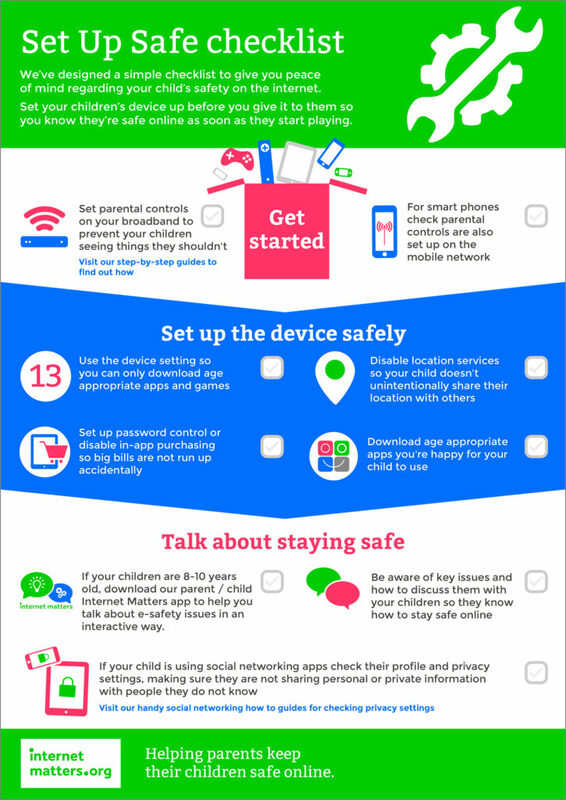 To set your parental controls on devices. Controls – set your parental controls (the red house will appear), you will need to have your log in for accounts eg Virgin media to set the parental controls - it is also advised to do this a grandparents houses. For Android phone you need to go to google play settings. ‘Our Pact’ is a very good app for blocking internet access and app access. There are many ways that you can support your child in their learning and you will find lots of information below to help you. You may also find additional information in the curriculum section of this site. Below are links to some websites which children or parents might enjoy. Please note: the contents of websites are subject to change. St Joseph's Catholic Primary School does not accept responsibility for the contents of these websites. Please contact the school if you find any of these links to be inappropriate. Reading with your child Author of 'The Gruffalo' Julia Donaldson shares her top tips for getting a great start in reading with your child. BBC for schools An excellent resource with a great deal of material to keep children (and parents) interested.